Opioids offer narrow improvements over a placebo for pain and physical functioning, on average, but those benefits tend to decrease over time and come with the risk of side effects such as vomiting and constipation, according to the review of nearly 100 randomized trials published in the Journal of the American Medical Association. Down the line, risks may include physical dependence and overdose, and harms and benefits of opioids for chronic noncancer pain remain unclear. This meta-analysis included 96 randomized clinical trials and 26, 169 patients with chronic noncancer pain. 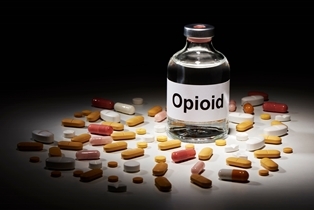 It found that the use of opioids compared with placebo was associated with significantly less pain, and improved physical functioning, but the magnitude of the association was small, yet opioid use was significantly associated with increased risk of vomiting. Yet a 2013 study estimated that one in five patients who see a doctor for acute or chronic noncancer pain get prescribed opioids, even though alternative treatments that may be effective can be out of reach for many patients, in some cases because insurance doesn’t reimburse adequately for these services. The CDC describes chronic pain as "lasting longer than 3 months or past the time of normal tissue healing." It is among the top reasons for seeking medical care in the US, affecting just over 20% of adults -- about 50 million people -- in 2016, according to one reportthis year. Other estimates suggest that the number is twice that. More than three-quarters of studies in this analysis were funded by the pharmaceutical industry, the study points out. In recent years, pharmaceutical companies have come under fire for aggressively marketing opioids to doctors. Leading up to the early 2000s, opioids were seen as a wonder drug, and doctors were urged to treat pain more aggressively. Former Surgeon General Vivek Murthy wrote in an open letter that doctors were taught that these medications were not addictive if patients were in "legitimate pain." Multiple studies have shown this to be false.